Copyright DeWoolfson Down International, Inc.
Where do I find your Shipping and Return Policies? What is your warranty on down filled comforters? 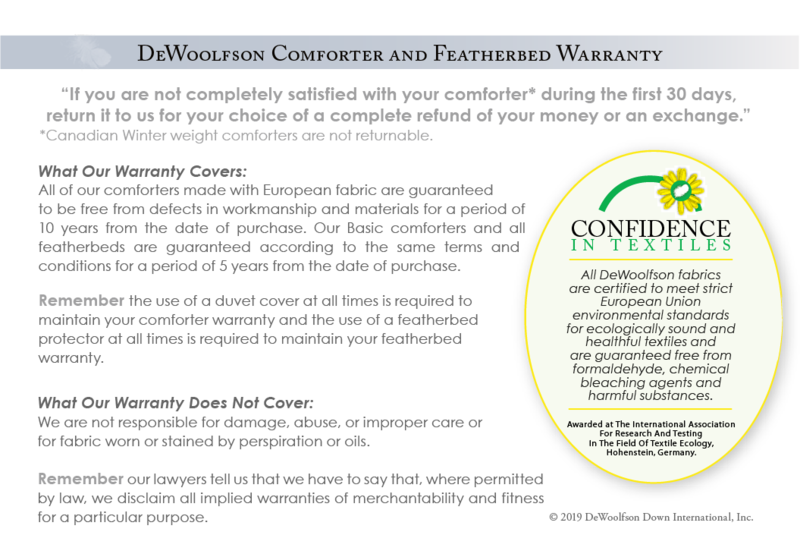 The fabric and construction of all DEWOOLFSON down filled comforters is guaranteed to be free from defects and workmanship for a period of ten (10) years from the date of purchase. The use of a comforter cover is required to maintain your warranty. We are not responsible for damage, abuse or improper care, or for fabric worn by perspiration or oils. This warranty is given in lieu of all other warranties expressed or implied, including the implied warranties of merchantability and of fitness for a particular purpose. What is your warranty on down and feather pillows? The fabric and construction of all DEWOOLFSON down and feather pillows is guaranteed to be free from defects and workmanship for a period of five (5) years from the date of purchase. The use of a pillow protector is required to maintain your warranty. We are not responsible for damage, abuse or improper care, or for fabric worn or stained by perspiration or oils. All pillows will absorb perspiration and body oils, and we are not responsible for the softening or "breaking in" of pillows as a result. This warranty is given in lieu of all other warranties expressed or implied, including the implied warranties of merchantability and of fitness for a particular purpose. What is your warranty on featherbeds? The fabric and construction of all DEWOOLFSON featherbeds is guaranteed to be free from defects and workmanship for a period of five (5) years from the date of purchase. The use of a featherbed protector is required to maintain your warranty. We are not responsible for damage, abuse or improper care, or for fabric worn or stained by perspiration or oils. This warranty is given in lieu of all other warranties expressed or implied, including the implied warranties of merchantability and of fitness for a particular purpose. Sateen refers to the weave of the fabric, not the fiber content. Cotton sateen weaves are produced by interlacing long floats of cotton yarn over the face of the fabric. It results in a soft, supple fabric with a subtle gloss. It is a version of the satin weave. Will my cotton sateen sheets lose their gentle luster? Yes. New sateen sheets do have a gentle shine but that will disappear after washing. However, the fabric will actually become softer and more supple with use. To return some of the luster, remove from dryer while still slightly damp and iron on cotton setting. What is the proper care for matelasse coverlets and shams? With proper care, your investment in fine linens will last many years. All linens that we sell are packaged with care instructions and many have sewn-in labels with laundering instructions/symbols. Please follow your manufacturer's recommendations. Although historically matelasse fabrics are dry clean only, many today are machine washable. If your matelasse is machine washable, may we suggest the Le Blanc linen care and cleaning detergents, which are formulated for each fabric and proven to clean gently. Always read your product's cleaning label before choosing a method of cleaning. Should I bleach my white linens? While you should always follow your manufacturer's recommendations, we do not recommend bleach in any form, even for whites. We find that bleach can eventually yellow even white linens, cause damage to the yarns and decrease the life of your fine linens. Use cautions: we recommend that you not use any laundry detergent that contains bleach for any fine linens. May we suggest Le Blanc linen care and cleaning line of detergents, which are formulated for each fabric and proven to clean gently. Dye Lots. I know that the same color in the same fabric can differ according to when it is produced. What can I do to assure that the dye lots are the same in my order? In order to assure uniformity of all linens of the same color and collection, be sure to order all items at the same time. For example, if you need two shams and a coverlet from the same collection and color, try to order all items at the same time. If you order the shams at a later date, there is no guarantee that the colors will be an exact match. How do I care for my fine linens? With proper care, your investment in fine linens will last many years. All linens that we sell are packaged with care instructions and many have sewn-in labels with laundering instructions/symbols. Please follow these guidelines. We recommend laundering unless dry cleaning is specifically recommended on the product. Unless otherwise specified, all fine linens should be laundered separately on a gentle cycle in warm water. May we suggest Le Blanc linen care and cleaning line detergents, which are formulated for each fabric and proven to clean gently. DO NOT BLEACH OR USE DETERGENTS THAT CONTAIN BLEACH OR WHITENERS. WARNING: The use of face creams containing benzoyl peroxide, alpha hydroxy or other similar ingredients will cause white and/or yellow staining of all fine bed and bath linens. Dry on low heat and remove promptly. Smooth out wrinkles, fold and enjoy. Almost all better quality linens are made of 100% cotton. Cotton is the most comfortable of all fibers. Most of our customers simply enjoy their linens and do not worry about ironing. The "rumpled" look is expected. Shrinkage can range from as little as 2% to 4% or as high as 10%, depending on the fibers used. Hot water and excessive heat will greatly increase shrinkage. How do I launder Habidecor bath rugs? These rugs may be machine washed on low temperatures and gentle cycle. Please use gentle detergents. May we suggest Le Blanc linen care and cleaning detergents, which are formulated for each fabric and proven to clean gently. Do not use bleach, detergents containing bleach, or liquid fabric softeners. Tumble dry on low temperatures; shake rug after drying to the re-fluff pile. Do not vacuum. Staining and the Use of Certain Face Creams and Teeth Whiteners. The use of face creams containing benzoyl peroxide, alpha hydroxy or other similar ingredients, as well as teeth whiteners, will cause white and/or yellow staining of all fine bed and bath linens, including white and colors. How do I launder Abyss towels? We recommend cold water wash. Tumble dry at low temperatures. Do not wash towels and rugs together. Always wash towels separately from other home textiles and garments (zippers, hooks, snaps, and velcro can pull terry loops.) Use maximum water and ½ the recommended detergent. Do not use detergents with “Brighteners” or “Bleach Alternatives” – these can remove color. May we suggest Le Blanc care and cleaning detergents, which are formulated for each fabric and proven to clean gently. Do not use fabric softeners. They clog cotton fibers and prevent them from wicking moisture. They can also remove color from the rugs and towels. Never use bleach, even on white rugs and towels. Certain cleaning and hygiene products contain ingredients which cause bleaching or staining, some of these include: blemish creams, products containing alpha hydroxy and fruit acid, hair coloring products, some bathroom cleansers, and teeth whiteners. Never vacuum rugs. Do not Dry Clean. Do not iron. What is the best way to clean a down comforter? First, if properly covered with a protective duvet cover, comforters need very infrequent cleaning. When you must clean it, we suggest that you have your comforter professionally laundered in water (after all, geese do live in water). We do NOT recommend dry cleaning fluid. Please contact our down specialists for ideas, suggestions or alternative cleaning methods. Comforters should not be washed at home. Down comforters are too large for home washers, and if the fabric is torn by the agitator the down can escape, damaging your washer and possibly causing the water to back up into the laundry room. Down comforters must be dried thoroughly, often requiring several hours in a large format or commercial dryer set on low heat. Drying time will depend upon size & weight/warmth level. Remove frequently throughout drying process to fluff. As it dries, the comforter may expand so much that it will block the escape of hot air from the dryer, resulting in a scorched comforter and a high risk of fire. Do not leave any down product in a dryer unattended. After washing, do not store in plastic, but allow to air for several days. Your DEWOOLFSON Down product came with a breathable bag. What is the warranty on your comforters and featherbeds? What is not covered? 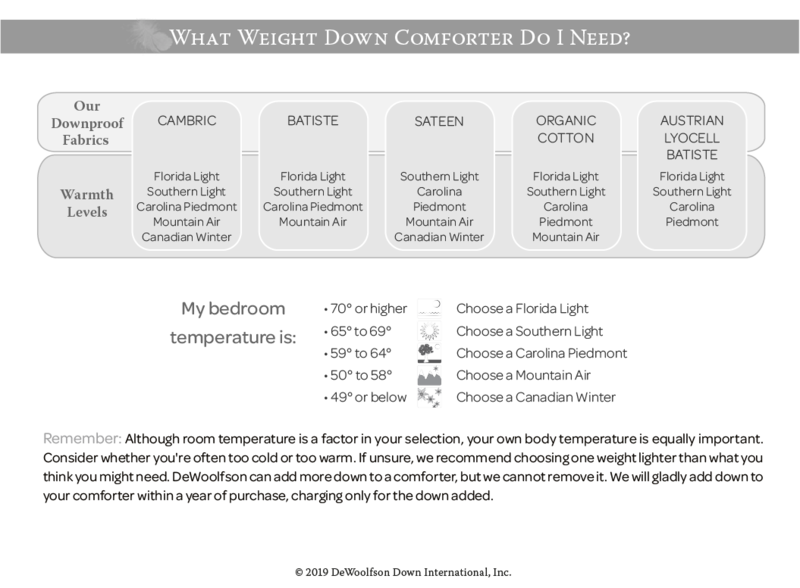 How do I select the CORRECT WEIGHT COMFORTER? We use proven downproof fabrics, engineered by German mills with well over a century of experience in producing specialized textiles. Cambric is good for all weights and is the best value. Batiste, 1/3 lighter than all our other fabrics, is made with the world's finest long staple cotton. Sateen is best for medium to heavy desired weight with its silky texture. Organic Cotton Batiste has a Cambric weave and certified organic. Natural Lyocell Batiste is best for light to medium weight. This fabric is made from the Eucalyptus tree into a cellulose-based fabric. What determines the warmth of a comforter? What is fill power? 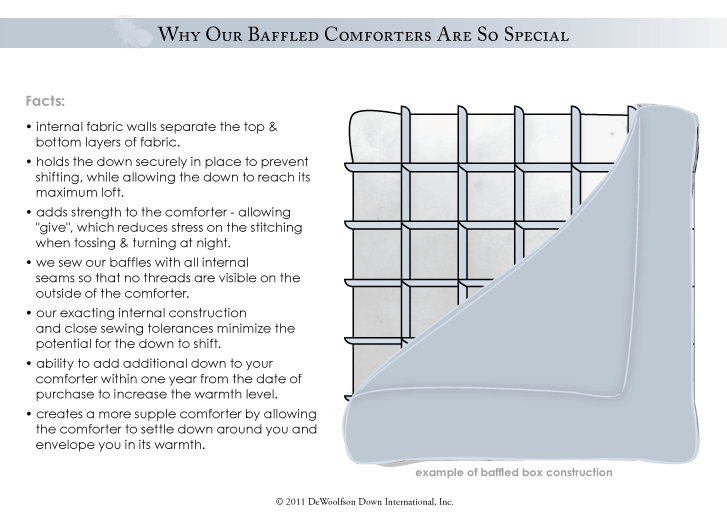 Why are some comforters baffled? Duvet is simply the French word for down, but it is commonly used to refer to a comforter. A duvet cover is a comforter cover that protects your comforter and can be removed for regular washing. And it can be color coordinated to your bedroom. A down comforter with a duvet cover can become your bedspread, blanket, and top sheet - all rolled into one. It's a fun, cozy way to sleep. We recommend that your duvet cover is made from lightweight, sheet-type fabrics, preferably from cotton or even silk. The lighter the better. While tapestries and matelasse are fine for coverlets or bedspreads, they are too heavy to sleep under comfortably. We also caution against using heavier weight chintz fabric, such as that used for upholstery or draperies. It also is too heavy for good sleeping. Most Americans prefer to sleep with an additional top sheet, so they will have to launder their duvet cover less frequently. But for a really cozy sleep, we highly recommend that you be daring - sleep under the duvet cover without a top sheet. It's lighter, less restricting, the traditional European way, and our favorite. 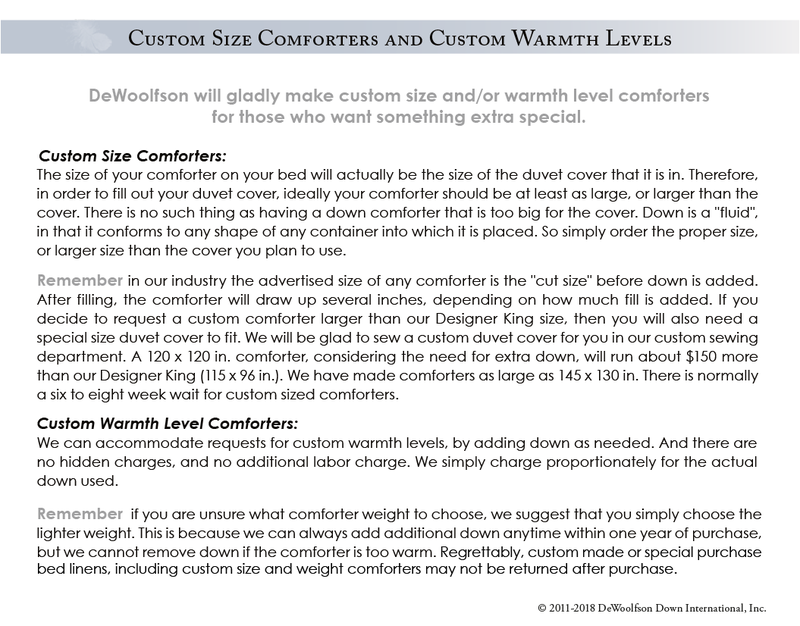 We do not see the exact size comforter that we need in your catalog. Is it possible to make a custom size for us? Do you offer a German-sized comforter? Yes, we do. You are probably referring to the comforter widely used in Germany that is 135 x 200 centimeters, or 54 x 78 inches. This Daunendecke is just large enough for one person to wrap up in to sleep, and is often preferred over those in the U.S. that cover the entire bed. With a duvet cover it is like wrapping up in a big jelly roll! They can be filled to any weight, although the ones used in Germany are quite full. If you want them as thick as they use in Germany, then it would need at least 60 ounces of white goose down fill. Prices are comparable to those comforters shown in our regular line. What are the sizes of DEWOOLFSON Down comforters? 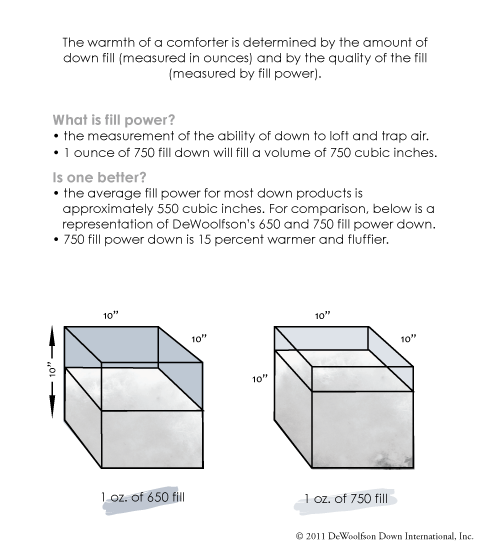 What can you tell me about your down fills? Why isn't my coupon working at checkout? We urge customers to beware of fake coupons or coupon codes, whether online or in print, and to know how to recognize coupon fraud. DEWOOLFSON cannot recognize or honor any purported coupon or coupon code other than those that it officially issues. Official DEWOOLFSON coupons and coupon codes are an invitation and not to be construed as an offer, and may be terminated by the company at any time. DEWOOLFSON does not issue coupons through third-party sites. Coupon fraud is a serious offense as well as copyright and trademark infringement. Yes. We are delighted to ship internationally. We can ship via UPS, FedEx, or through the postal service. The customer is responsible for import duties and local taxes. Where did the name DEWOOLFSON come from? DEWOOLFSON is the name of the company founder's family. The family lived in London during most of the 19th Century. One of the sons of Theodore DeWoolfson and Maria Estevan arrived in the United States around 1910 on the Cunard Line's Lusitania. 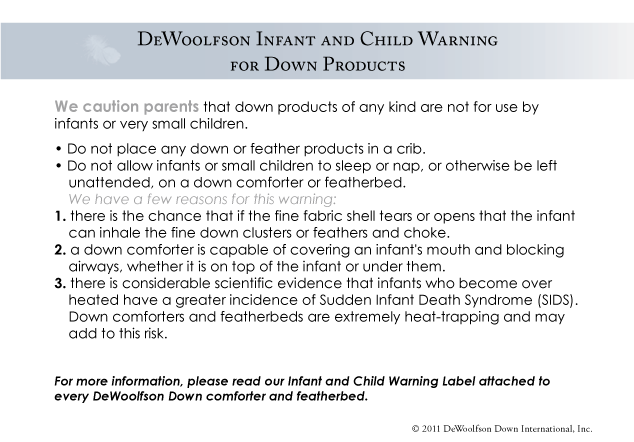 DEWOOLFSON's INFANT AND CHILD WARNING for Down Products. Only coupons issued directly from DEWOOLFSON can be honored. We issue coupons only through our newsletters, direct mail and on DEWOOLFSON websites. DEWOOLFSON does not issue coupons through third-party sites. Coupon fraud is a serious offense as well as copyright and trademark infringement. We urge customers to beware of fake coupons or coupon codes, whether online or in print, and to know how to recognize coupon fraud. DEWOOLFSON cannot recognize or honor any purported coupon or coupon code other than those that it officially issues. Offical DEWOOLFSON coupons and coupon codes are an invitation and not to be construed as an offer, and may be terminated by the company at any time. What causes my down pillow to break in and get softer with use? Simple. The absorption of body oils, perspiration, and humidity through the cotton shell and into the down cause a pillow to break in. A pillow protector will help protect your down pillow, provided you remove it and wash it often. We've noticed that down pillows last far longer in dry climates and in air conditioned bedrooms. Oils and humidity are their enemy, working their way into the fill causing it to mat, clump and deteriorate. But remember, this happens to synthetic pillows as well. Consider the relative cost of your pillow to the years of comfort and use you will receive. It seems reasonable that a pillow, like everything else, should be replaced after its usable life. Can you get mold out of pillows? Sorry, but getting mildew out of down is one thing that we've not been able to do. Please store all down products in a dry place. 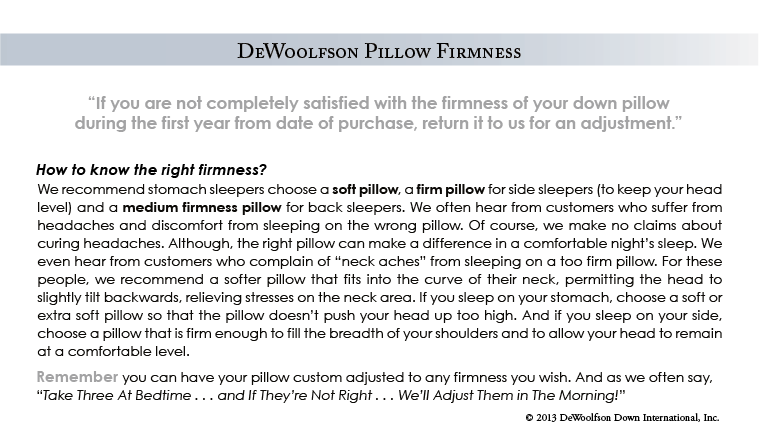 How do I know which is the right firmness pillow for me? 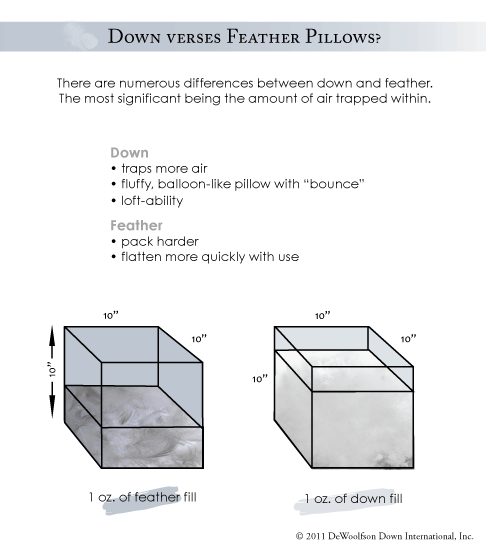 What is the difference between a down pillow and a feather pillow? Do you offer custom shape pillows? If I want to wash my pillows myself, how would I do it? While we hear of customers who have great success in washing pillows, we have many who tell us that it is extremely difficult. And it can be dangerous to your home washer. First, we do not recommend doing it at home or in an agitator machine. If the agitator tears the fabric, and the down escapes, it can block the water exhaust and overflow into your home. This is especially likely to happen with older pillows whose fabric is weakened from oils, perspiration, and age. Next, pillows tend to trap air and "balloon," causing them pop out of the top of the washer. So, we recommend washing only in a front loading commercial washer, using regular detergent. But even here, be sure that the fabric is not too old or deteriorated from body oils or weakened from age. When the pillows are wet you will smell a pungent odor. This odor is natural with all down products, and will disappear when the pillows are completely dry. Be certain to dry the pillows very thoroughly so that they don't mildew. This will take three or four hours in a large commercial dryer on medium heat. Pillows in a hot commercial dryer can easily burn so be careful. Do not leave them unattended in the dryer. Take them out and fluff regularly when drying and check for overheating. If too many pillows are placed in the dryer the hot air cannot escape and a fire is possible. Finally, the downproof ticking on good quality pillows does not want to let water pass through, nor let the oils or dust inside escape. For most people, the answer is to use a good quality pillow protector, wash and change it weekly with your laundry, and discard the pillow when its life expectancy is over. What is the warranty on your pillows? Help, my pillow is too soft or too firm. Find our adjustment form here. Our goal is to ensure your down pillow is exactly the way you want it. Comfort is key. Whether you like it extra soft or prefer a more supportive pillow, we will customize to your preferences. from date of purchase, return it to us for an adjustment." Why are featherbeds made from feathers and not all down? Our featherbeds are available in your choice of 10%, 20% or 50% white goose down blended with small, delicate white goose feathers. Featherbeds are made of feathers because they offer more support than down. You would probably sink into a down bed so far that you couldn't get up! And it would take so much down to support your body weight that a 100% down bed would become prohibitively expensive. In shopping, what should I look for in a good QUALITY FEATHERBED? 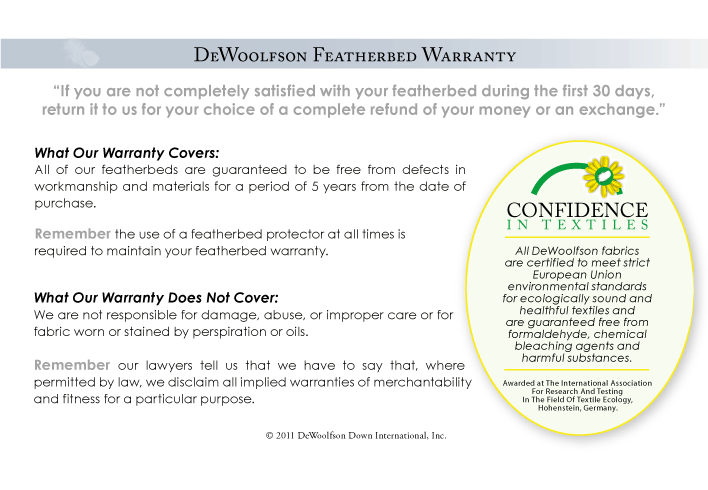 What is the warranty on your featherbed? How do I cover a featherbed? Why do you not put a fabric boxing or gusset around the outer edge of your featherbed as some other manufacturers do? Simple, and common sense. It may look good in the photographs, but it is unnecessary and impractical and serves little purpose. The fabric wall comprising the outer edge of the featherbed will just not retain its shape under full body weight. It simply collapses underneath your cover or fitted sheet. Then you can feel two rows of piping and stitching, together with the extra band of fabric, gathered under your sheet and protruding from the side of the bed. 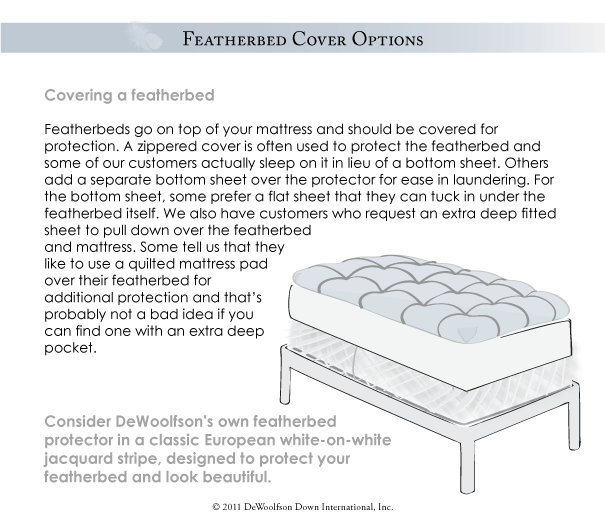 DEWOOLFSON has a simpler and more comfortable idea: We cut our featherbeds large enough so that when filled they "draw up" to the exact size of your mattress. And the single "knife" edge of piping lays flat against the corner of your mattress virtually undetectable under your sheets. This makes common sense. . . and after all, we think all of our customers should sleep like the princess and the pea. I can see some dark spots through the fabric on my pillows and comforters. What are they? Those dark spots that you see through the fabric are dark clusters of down. They are found in all white goose down, regardless of quality, and the more you press on the fabric the more you'll see them. Just like we get gray hairs, even white geese get some gray clusters as they get older. They are not feathers, and the fill is not inferior in any way. Indeed, if you were to open the pillow and allow the down to expand you probably wouldn't see them at all. They are usually only visible when compressed under fine, white fabric. Is THREAD COUNT important in downproof fabrics? Placing reliance on thread count as an indicator of the downproof quality of fabric is a mistake. What is important is the type and size of yarn, the density with which it is woven (which is a different issue than thread count), and the specialized finishing techniques needed to insure the fabric's downproof qualities. We use several different types of fabrics on our comforters and pillows. Most are made from fabric woven by specialized textile mills that have been weaving downproof fabrics for over a century. These fabrics offer the ideal combination of downproof qualities, strength and durability, and a fine hand. Their downproof character is derived from the fact that they combine the appropriate size yarn necessary to provide durability over years of use with a dense weave. While our thread counts range generally from 226 to over 400, we do not think that consumers should focus on this issue. In our nearly 40 years in business, we have seen high thread count fabrics woven by less experienced mills, or with inadequate quality control or finishing processes, that have leaked down excessively. Our experience is that thread counts under 300 actually provide the best combination of durability, absorbency, performance, and feel. Fabric can be woven densely at 226 threads, or at 400 threads. But in order to weave more threads per inch, each yarn has to have a smaller diameter. This results in a cloth that is too fine and delicate for the heavy use that pillows and comforters take at night. The fabric must be durable enough to hold down and feathers, to hold the stitching over many years of "tossing and turning" and to withstand exposure to perspiration. Indeed, the weave in our 226 thread count cambric is actually "tighter" than most fabrics that are advertised at twice the thread count; it's just that the yarns are of the optimum size and density. Additionally, the fabric is calendered in the finishing process by being put under tremendous pressure and heat to assure complete downproofness and fine touch. The thread count on the pillows ranges from 226 to a 280 thread count twill, and we do match the weave to the relative percentage of down and feather blend being used. Every blend of fill requires a different fabric. We would be glad to send a swatch of fabric to you for your inspection. What is the LAW LABEL attached to my comforter or pillow, and how do I read it? A “law label” is a disclosure label required by state law to be sewn into every bedding product made of filling encased in an outer cover. This includes comforters, pillows, featherbeds and mattresses. The label must disclose, in language specified by law, the type of filling, and in the case of down products, the exact percentage of down and feathers. This is the best way to determine the exact contents of the product you intend to buy – because advertising and packaging regulations are vague and rarely enforced. Law labels may be attached only by bedding manufacturers and others licensed to do so. The agencies which license manufacturers and regulate the content of their law labels are usually a part of a state’s department of public health. HOW DO I TELL IF MY PRODUCT REALLY CONTAINS DOWN OR FEATHERS? First, understand three terms: down, feather, and fiber. Down is the soft, fluffy clusters taken from the undercoating of geese or ducks (and it is many times more expensive than feathers). Feathers are the bird's outer covering, and have a hard, spiny quill. Down has little weight, but great insulating abilities. Feathers are relatively inexpensive, but are heavy and do not insulate nearly as well. Fiber refers to pieces of damaged or broken down clusters or feathers. ALL THREE OF THESE ARE PRESENT IN PRODUCTS SOLD AS “DOWN.” This is because the mechanical process used to sort down from feathers is not perfect. Some feathers and fiber, in trace amounts, will always remain in the purest down fill. So, it is inaccurate and contrary to law, to state that a product contains "all down," "pure down," or "100% down." Don't let a salesperson tell you that it does. The 85 percent does not mean that the product is inferior. Indeed this item would contain over 13 percent more "down" clusters than the 75% minimum that is required by law. And remember, any product with 85% down clusters would have such a small trace amount of feathers and fiber that it would be virtually undetectable. Moreover, it is practically impossible to mechanically sort the down finer than 90 to 95 percent (about a 750 fill power down rating). 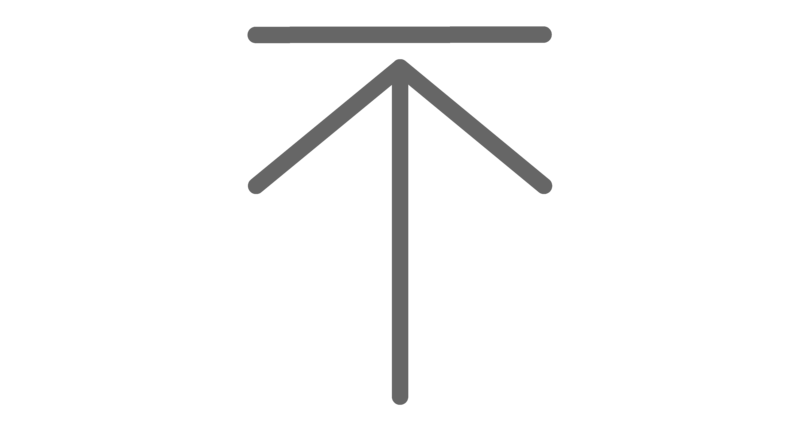 WHAT NEED NOT APPEAR ON A DOWN LAW LABEL? Although every state has different disclosure requirements, many states do not require that the color or the species of the bird be disclosed. For instance, many states allow the use of the term “white down” without stating if it is made of goose or duck. Similarly, many states allow the term “goose down” without disclosing if it is gray or white. Beware of feather pillows labeled "crushed feathers" as they are made of large feathers in excess of the legal limit to be sold as whole feathers, and had to be crushed in order to be used. 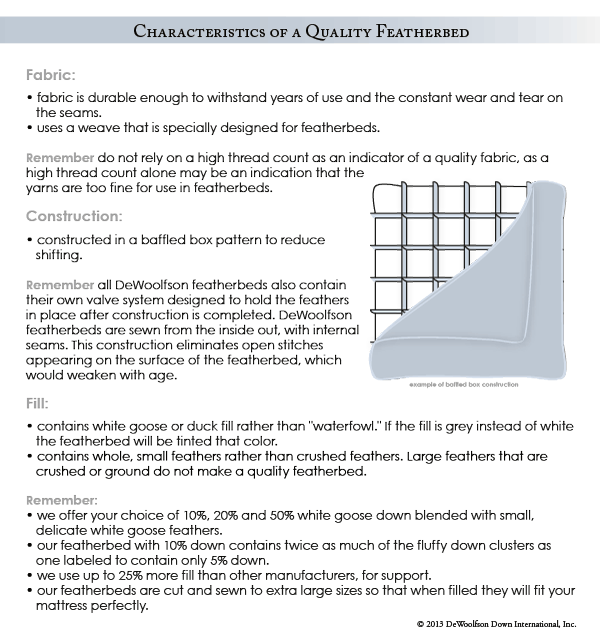 Of course, there are many variables that determine the quality of a down or feather fill . . . .and in the end, the best advice is to purchase only from a manufacturer that you trust. The truth about HYPOALLERGENIC DOWN. ARE YOU ALLERGIC TO DOWN . . . OR TO MOLD? Before we talk about allergies to down, keep in mind that there are probably more people allergic to mold or dust mites than to new down fill. We often hear stories of someone who won't sleep on a new down pillow because they once had an allergic reaction to one while sleeping at "grandma's house." Before you give up the great comfort of a down pillow, consider whether that old pillow was stored in a damp, mildew-prone area of the house. If so, you may not really be allergic to down at all. DeWoolfson Down will never use the term "hypoallergenic" with regard to any down or feather product because we do not believe that the use of the term is appropriate. Anyone who is allergic to goose dander is simply going to be allergic to goose down. There is no scientific basis for concluding that washing and rinsing down, no matter how well, or by treating it with any solution, will remove 100% of the dander, or result in hypoallergenic down, and we encourage you to beware of claims otherwise. To illustrate, if you are allergic to eggs, there is no way to process them, treat them with chemicals, cook them or bake them, that will prevent an allergic reaction. Indeed, science tells us that we would have to alter the DNA molecule in order for someone with true allergies to no longer be affected by that allergen. An impossible task indeed. It is common sense that washing down and feathers will not prevent it from causing an allergic reaction in those who are truly allergic. 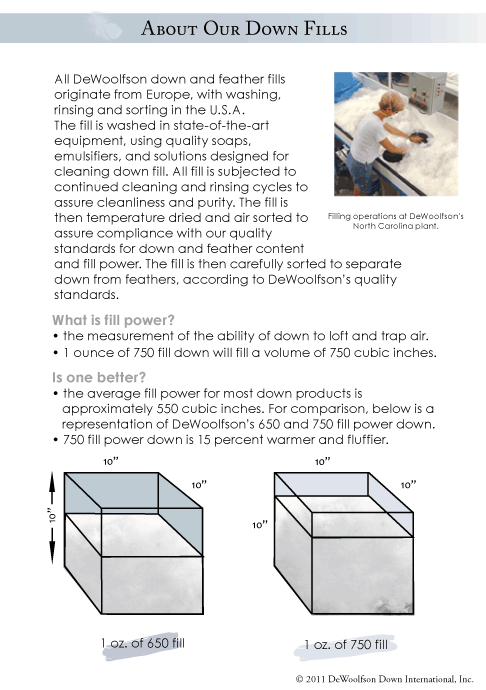 DeWoolfson Down's quality fills do go through state-of-the-industry washing and processing in specialty down soaps, containing surfactants and emulsifiers, with German-engineered equipment. Our down undergoes multiple washing and rinsing cycles, to assure cleanliness and sanitation. Air drying includes a specialized de-dusting vacuum system that further removes dander and fine particles. Despite this level of cleaning and processing, we will not label even our finest down fills as "hypoallergenic". We believe that some companies using the term hypoallergenic are referring not to allergies to down, but to allergies to molds or spores that can form in pillows or comforters that are not properly cared for. We have seen claims that some down is treated with anti-mold and fungicides that will retard the growth of bacteria and spores. In using the term "hypoallergenic" these companies may be referring to allergies caused not by down, but by mold. Our experience has shown, however, that these chemicals are toxic and not something that we, or our customers, would want to sleep under every night. We know of one case where an employee was exposed to these chemicals, causing burn-like blotches that required several weeks of treatment. It's far easier and safer to just store your down products carefully, and like anything else, away from damp areas. Keep in mind that many people truly are allergic to dust and dust mites. While mites can attach to the surface of the comforter, scientific studies done in Europe have shown that dust mites cannot penetrate the downproof fabrics used in down comforters, pillows or featherbeds. We recommend a good duvet cover that closes securely and is laundered often. 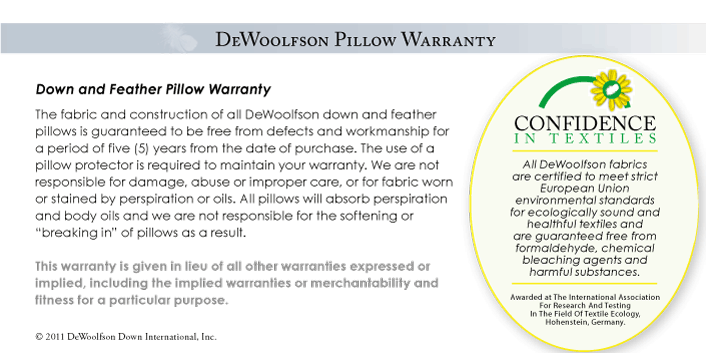 DeWoolfson pillow protectors are made from downproof fabric and are inherently dust mite proof. In conclusion, if you are truly allergic to down, then we recommend that you select another product. 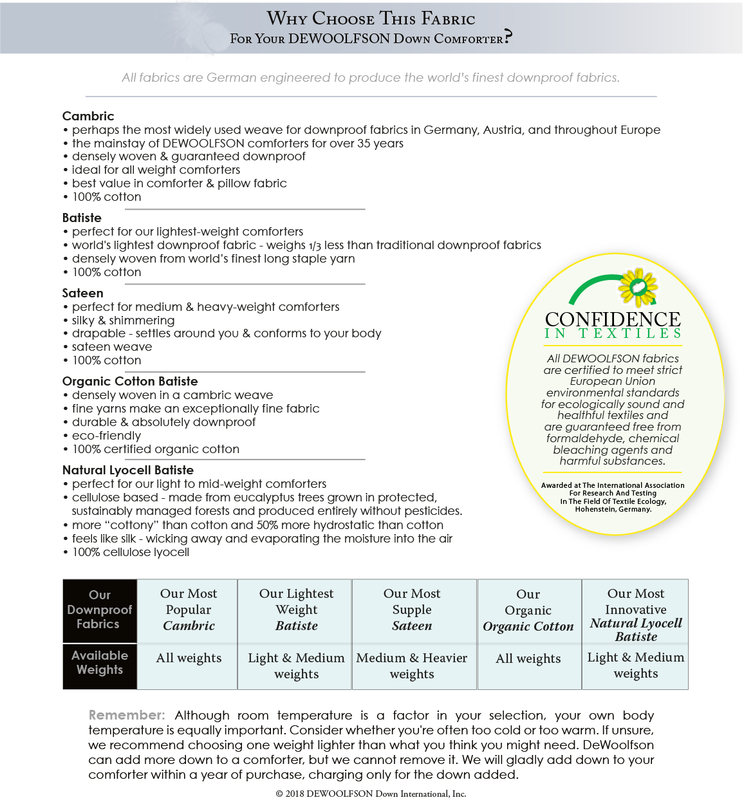 What is the DEWOOLFSON Confidence in Textiles Guarantee? 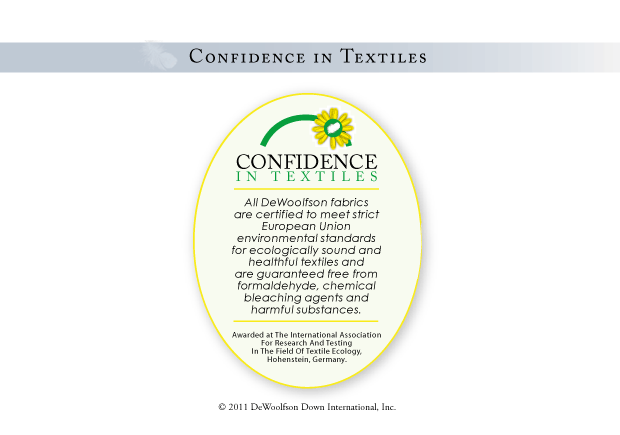 All DEWOOLFSON fabrics are certified to meet strict European Union environmental standards for ecologically sound and healthful textiles and are guaranteed free from formaldehyde, chemical bleaching agents, and harmful substances. Awarded at The International Association For Research and Testing in the Field of Textile Ecology. Hohenstein, Germany. Where does your down originate and where is it processed? DEWOOLFSON uses only down and feather fills that originate from Europe. All fill is sterilized, washed, rinsed and sorted in the U.S.A. The fill is washed in state-of-the-art equipment, using quality soaps, emulsifiers, and solutions designed for cleaning down fill. All fill is subjected to continued cleaning and rinsing cycles to assure cleanliness and purity, and processing is subject to the supervision of the state's health department. The fill is then carefully sorted to separate down from feathers, according to DEWOOLFSON’s quality standards.